It is quite fitting to take a look at one of Molly Crabapple’s recent ventures as I am about to embark on my own foray. I have to say, Molly is one of my favorite cartoonists. I admire her style and her spirit. 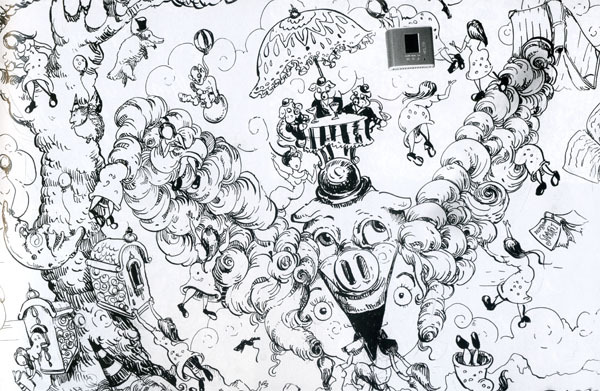 I don’t know what she’d advise for my solo 24 Hour Comics Day at the Sorrento Hotel this weekend but I have this book of her creative adventure in a hotel: “The Art of Molly Crabapple, Volume 1: Week in Hell.” Now, was it really a week in hell? Let’s take a look. 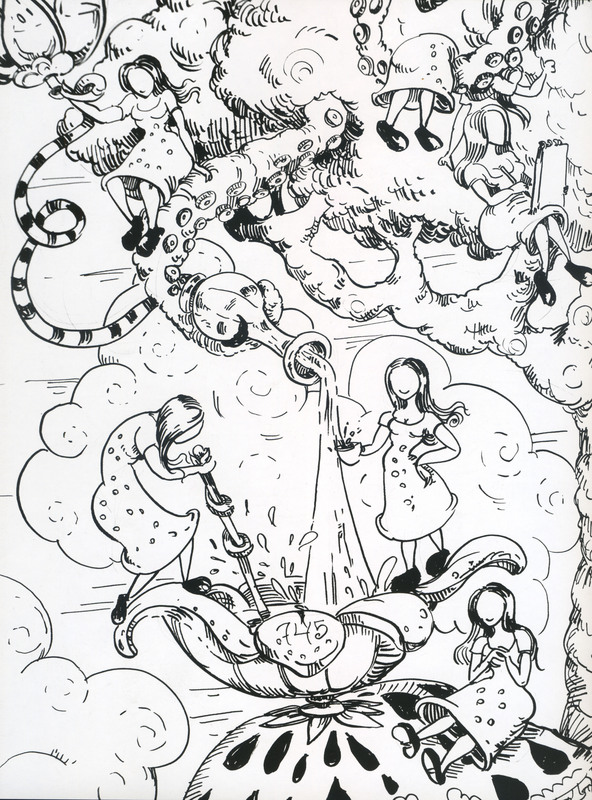 This work above has a number of the “girlthings” motif that Molly employed throughout her project. The number “745” indicates the number of supporters she got for her successful Kickstarter campaign. This work above is of Molly’s friend, Stoya, and comments on all the amateur photographers who crowd her space. They are depicted as lizards, which they probably enjoy! And this work gives us Marie Antoinette’s head being split open to reveal all the bad Piggy Bank interests. Revolution has struck! Molly has certainly done her part with her illustrations reporting on the Occupy movement. She even allowed her own loft to be converted into a laptop charging station for reporters covering the police brutality down the block. This is a beautiful book! Molly, as always, is an inspiration. The forward by Warren Ellis is very instructive. We get a peek into the creative process from his words. 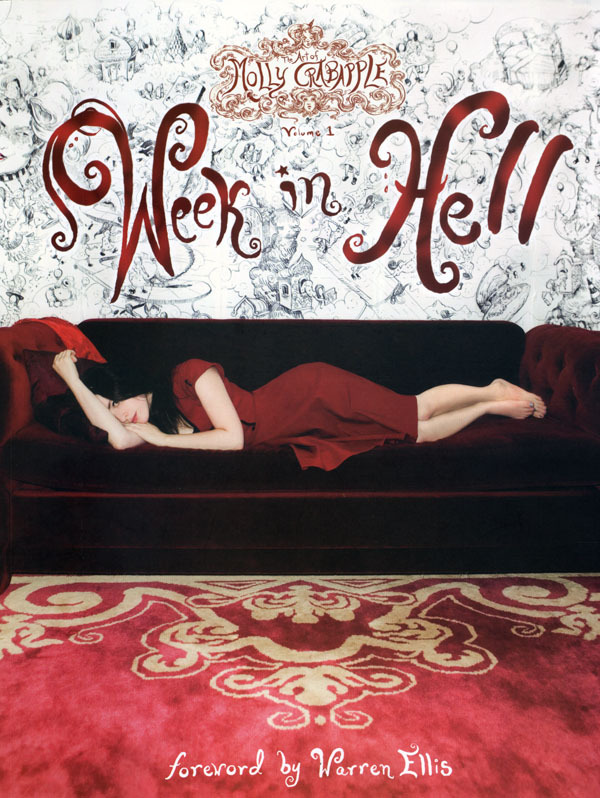 The idea behind “Week in Hell” was to see what Molly could accomplish as an artist if she was locked up, sort of speak, in a room and had to face her demons, had to see what she could create that was new and not simply repeat herself. Well, this artist has succeeded. “The Art of Molly Crabapple, Volume 1: Week in Hell” is published by IDW. It is a 48-page full color trade paperback and is listed at $9.99. Visit our friends at IDW Publishing.